Is there an easy way to repair the stone chip in my front fender? Although nothing will restore the perfection of the original finish, many options exist for creating an improvement over having stone chip damage. The first thing I have to ask when I get a request such as this is “what color is the paint where the stone chip is?” Solid colors allow for an acceptable repair compared to the metallic jobs or paints with the pearls and other effects in the topcoats. If bare metal is exposed, the steel will need a coat of primer. Since we are dealing with a minute repair, all the paint should be applied with a small brush. My favorite is Loew Cornell series 5040 ten aught. After cleaning the interior of the chip with a short piece of optic filament cable, carefully prime only the bare metal and not the sides of the crater where the paint is still intact. Next using the genuine Harley-Davidson touch up color, the long tedious process of building up layer after layer of paint to fill the void begins. Dab a little bead in the chip and allow to dry. Then repeat until the color is actually rounded up and over the adjacent paint. When this thick buildup of paint is thoroughly dry, wet sand first with 1000 grit and later with 1500 grit sandpaper wrapped on a small rubber block with plenty of water. Lay parallel strips of masking tape on either side of the chip for the outside edges of the sanding block to ride on and sand only with back and forth movements to “knock down” the excess touch up paint. The masking tape strips act as a shim to efficiently insure accuracy of flattening the top of the mound of touch up paint to create an acceptable result. Frequently stop to clean and dry the entire area to inspect. Prior to sanding the surface flush with the surrounding original finish paint switch to 2000 grit sandpaper. Repeat until you cannot feel the surface irregularity with the back of your fingernail. You are now ready to polish the paint and restore the shine. On a soft polishing towel put a dab of Micro finish compound and rub only the area that is dull from sanding using only back and forth movements. When a sufficient improvement is noticeable it is time to switch to “Hand Rubbing Glaze” (my favorite is made by Presta) to polish or buff to a high shine. Although upon close inspection a repair such as this is usually slightly noticeable, the integrity of the surface of the paint is restored. If the repair remains unsightly consider a pinstripe design created by a capable artist to become the most prominent feature of that portion of your bike. With a carefully made repair with the proper materials, the integrity and value of your scoot can be restored with a little investment of tender loving care. Happy sanding, if there is such a thing! Dave "Letterfly" Knoderer is a nationally-known artist who specializes in the many facets of motorcycle custom paint and decor including airbrush murals, pinstripe design, and more. During much of the year, he can be found at his home base near Tampa, Florida, in his art studio where he is available to work on your projects. During the rest of the year, he travels to customer locations and HOG events around the country. For more information about the artist known as Letterfly, please visit his web page, www.Letterfly.com. 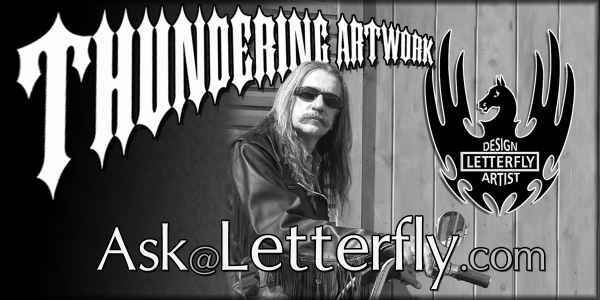 If you have a question that you would like to see answered in a future "Ask Letterfly" column, please e-mail it to Dave. These Ask Letterfly columns were created for Harley-Davidson dealers and HOG chapter members who need material to include in their HOG newsletters. Editors who would like to enlighten and educate their readership are encouraged to utilize this ongoing service, which is archived at www.AskLetterfly.com. The articles are written and provided by the artist Letterfly, known for high quality custom paint, airbrushed murals and motorcycle pinstriping in the Tampa area and throughout the country. This column is a forum to provide answers to the many paint related questions that Dave hears while attending and painting at Bike rallies across the country and which he receives by e-mail.